Tap Is Music. Rhythm Is Everywhere. If you ask Bril Barrett, he’ll tell you that to understand tap dance is to understand America. Tap dance is, and always has been, more than shuffle-steps and heel-toes. For Black tap dancers, it means taking part in traditions that have all too often been lost or taken. For dancers of any and all races, it means undoing some of the damage inflicted by the past hundred and fifty years of racism and oppression. And at M.A.D.D. Rhythms, which operates both as a dance company and as a teaching organization, it isn’t just an art form: it’s the heart of a community. The group runs a dance school, M.A.D.D. Rhythms Tap Academy, where adults and children alike come together to learn tap, and is also a partner with After School Matters (ASM), a program sponsored by the City of Chicago that trains high school students in a skill or trade. Between these two programs, M.A.D.D. 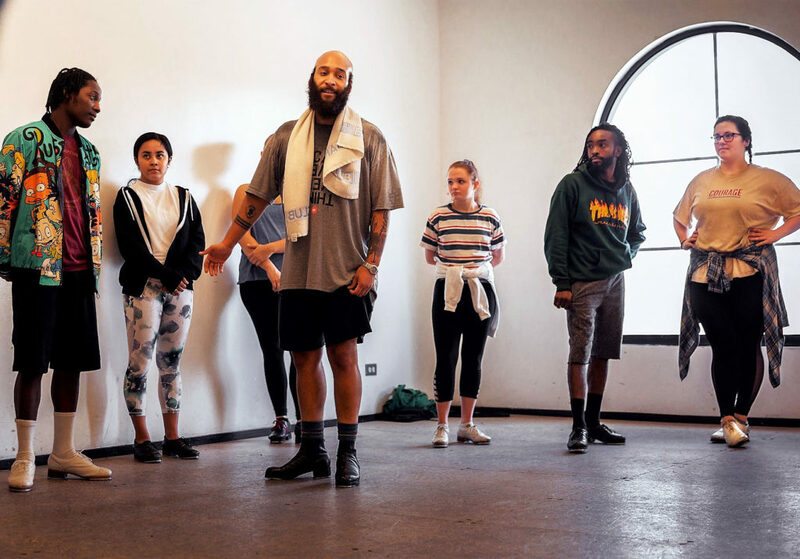 Rhythms brings tap to countless people on the South Side from its home at the Harold Washington Cultural Center in Bronzeville. The importance of this reach is hard to overstate. Over the course of a weekend earlier this month, M.A.D.D. Rhythms hosted its largest event: The Chicago Tap Summit, a celebration that brought dancers and performers from as far away as Brazil, Canada, and Mexico to the Harold Washington Cultural Center. The summit revolved around one central fact—that tap is music, and the dancers, musicians—and hammered it home through workshops taught by world-renowned faculty, tap jams, historical panels, and an incredible live tap concert. But above all, the Chicago Tap Summit expressed that tap is for everybody: for anyone who feels pain, for anyone who needs a listening ear, for anyone who has something to say. At the summit, rhythm was everywhere. Barrett makes it a point to devote the last few minutes of every class he teaches to this history. All of the original Hoofers—the collective of Harlem dancers who developed modern tap in the early twentieth century—were Black men and women who faced violent racism and discrimination. The man widely credited as the originator of tap dancing, Master Juba (née William Henry Lane), was a free Black man born in the early 1800s. But as Barrett makes sure his students know, Juba couldn’t perform professionally as a Black man; white audiences wouldn’t pay to see him. Instead, he was forced to wear blackface so he’d be read as a white minstrel imitating a Black man. Even the students who visited the summit from outside Chicago took something away from this history. One attendee, who traveled from Mexico for the occasion, mentioned during a panel that learning the history of tap in Chicago had inspired her to learn more about similar legacies in her own country. When students learn to take pride in their cultural heritage, they can’t help but become invested in making their communities better. Much of this community focus comes from M.A.D.D. Rhythms’ initiation process: every dancer who wants to become part of the professional company must first spend an apprentice year doing community service. Apprentices perform at local events where organizers don’t have the budget to pay performers, teach at ASM and the Tap Academy, and put on free workshops across Chicago. Izaiah Harris and Devin Mosely, two current apprentice members who came up through ASM, recognize the value in paying their dues and paying it forward. “Bril [Barrett] has taught us about dedication and commitment,” said Harris. “As apprentices, we’re not only builders of the building; we are the building. We are some of the pillars that are in M.A.D.D. Rhythms now.” “We can’t not care,” Mosely added. Megan Davis, another company member, is more succinct: “He kinda fathers all these kids.” It may be often said, but in the eyes of dancers and company members, it’s true. M.A.D.D. Rhythms is a family. This spirit of self-expression and improvisation was on full display at the professional showcase on Saturday night of the Tap Summit. Entitled “Feeling Good: A M.A.D.D. Rhythms Tribute to Nina Simone,” the show incorporated a live jazz band as well as four of the top jazz singers in the country, all of whom happen to be from Chicago. But when it came to the dancing, the show was almost entirely improvised—to the point that choreographed pieces were pointed out in the program. As Simone’s electrifying music was performed, the dancers used their feet as an instrument—a way to express the raw emotions that the songs brought forth. In one piece, “Mississippi Goddamn,” dancers took turns showing the audience how they felt with short improvised solos as the singer called out names like Trayvon Martin, Sandra Bland, and Laquan McDonald. In “Four Women,” a piece highlighting four of the female company members, dancers conveyed the importance of recognizing individual stories, of loving oneself, and of calling a woman by her chosen name. During “African Mailman” and “Don’t Let Me Be Misunderstood,” dancers took turns letting loose, cheering each other on, and playing with one another the same way that the Dyerettes did on this site over sixty years ago. And in what was perhaps the most heart-wrenching piece of the show, five Black men ages fourteen to forty-two took the stage as the vocalist sang “Strange Fruit.” Coming just a week after the McDonald verdict, the piece was terrifyingly relevant. In the same way that “Strange Fruit” takes the unbearable and turns it into a song that beautifully—and eerily—expresses the grief of a generation, the five dancers transmuted their pain into music and dance. As Barrett puts it: “Chitlins was never supposed to be a delicacy.” The act of spinning the straw of experience into the gold of art has always been central to Black culture. That’s how we got the blues. That’s how we got jazz, hip hop, step dancing, and countless other modes of creative self-expression. 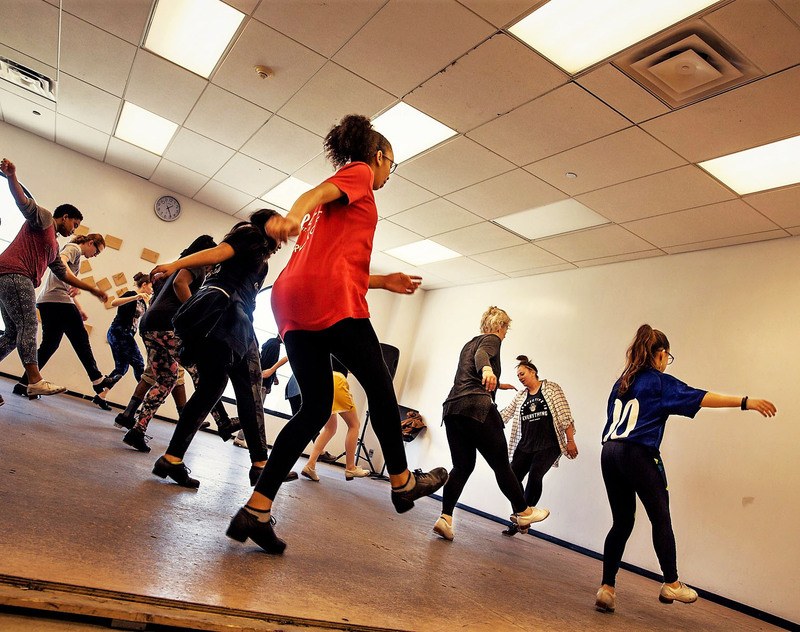 That’s how tap dance was born—and that is the tradition that M.A.D.D. Rhythms Summit was created to honor. Ailea works in Hyde Park and lives in Bronzeville. Catch her dancing with M.A.D.D. Rhythms on Thursday nights at the Harold Washington Cultural Center at 47th and King Drive. For more information, visit maddrhythms.com.